Sennah Yee [photo credit: Alice Liu] is from Toronto. She writes poetry, writes about films, and writes poetry about films. Her debut poetry/non-fiction collection, How Do I Look?, was published by Metatron Press in 2017. She is currently pursuing her PhD in Cinema & Media Studies, focusing her research on gendered robot design in media and technology. My first book has connected me with more like-minded writers and people experiencing similar microaggressions and insecurities, remembering sneaky cheat codes on The Sims... it’s been surreal and affirming! My two flash fiction chapbooks before this, The Aquarium and The Gl.a.de, have the same dry tone, but otherwise they feel so different from my writing now – the most obvious reason being that they were pure fiction, and my work is mostly non-fiction. I actually came to poetry last! Haha. I wrote short stories as a kid (mostly unintentional rip-offs/fan-fic of TV shows I was watching), then studied screenwriting in undergrad. I liked it, but I wasn't that great at it. 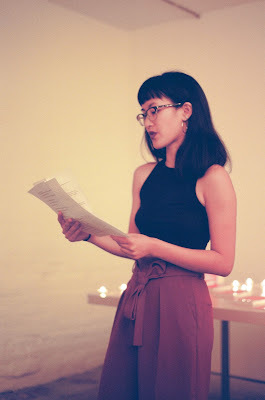 I turned to poetry because I felt free to experiment without worrying about logistical things like film budget, location scouting, casting, etc. When the mood strikes, I write VERY quickly, with minimal edits. But this burst is rare, and when it’s over, I don't write anything for a really long time. I need to do more casual free-writing, the way visual artists doodle for fun and practice. I definitely write a bunch of short pieces that end up coming together into something bigger. I didn't think any of the pieces in my book were linked until my wonderful editor, Jay Ritchie, pointed out common themes and patterns. I always get sick with anxiety before reading, but I still love doing them! I like meeting people and seeing who connects to what. But most of all, I love listening to others read their work. Maybe I’ve just been lucky to attend some really magical and moving readings, but lately I’ve been getting even more out of hearing others read than reading their work on my own! I’m still navigating how I choose to balance the important parts of my identity so that they are acknowledged and validated, and yet also not wanting myself or my writing to be reduced to those parts. As for the kinds of questions that I am trying to answer with my work: Who/what has control over how I look at myself/the world? In what ways can I return this gaze and reclaim this control? On a larger scale, the question of “who gets to tell stories?” is often brought up in the community – I think this is an important question, but even more important is who is listening to these stories? Who is elevating them and giving them the space to grow and be heard? Writing is a tool of empathy for me. You can rock people’s worldviews or just get your reader to laugh with you about a bad Tinder date you had. I love that it can do either and both of those things – teach, entertain. I’m not one to tell writers who or what they should be, but I do think that they should be aware of the kinds of power and influence that they can have. If we’re on the same page, it’s so easy and essential to me! I thrive on feedback, prompts, and deadlines. I was so lucky to have Jay as my editor for my first book; he made the whole process was a breeze. In the words of Uncle Ben from Spider-Man, “with great power comes great responsibility.” Hehe, but seriously. That and pay artists for their work, and get paid for your own work. Sadly I don’t have a writing routine – I mostly write when I'm supposed to be doing something else! A typical day for me is going to school, doing readings, refreshing Twitter on my phone in front of an open Twitter tab on my computer, and Netflix. Movies! They're both my procrastination and inspiration, which is a bit dangerous. As I said earlier, movies for sure are a huge influence on my work – not just the narratives and visuals, but also the art of screenwriting. I love how screenwriting aims to communicate as much information as possible in the most visual, succinct way. It's very poetic! Mitski, Jenny Zhang, Ocean Vuong, and Claudia Rankine come to mind instantly. Their work is so gut-wrenching and beautiful. Phoebe Wang’s poetry is also stunning; she has also been an incredible mentor to me and to so many other young writers of colour. Last but not least, the Metatron family are crucial to both my work and my life outside of it! The first Metatron book I read was Pony Castle by Sofia Banzhaf, which I inhaled and knew immediately after that I had to find out more about the press. Ashley has created this incredible community that is so inspiring and supportive; I am forever grateful. Write a novella! Something that is soft sci-fi. I wouldn’t mind being an editor – I liked story editing screenplays a lot during undergrad. I’m currently Interim Arts Editor at Shameless, a volunteer-run magazine for young women and trans youth. It’d be amazing to do something that strengthens the community like that full-time. It is the only way that I can make sense of things that move me and affect me, for better or for worse.